These days, we live our lives always on. Add in packed-to-the-brim schedules, plus other unavoidable stresses that come with the holiday season, and this time of year can only be described as chaotic. Everyone handles stress relief differently, but we've noticed quite an uptick in one particular form of relief… Marijuana, weed, pot—whatever you choose to call it, cannabis has quite a few calming properties. Since it can all be a bit confusing and intimidating, we turned to our friends at luxury cannabis company Canndescent for more information. The brand is currently changing the way people think about and consume cannabis by focusing on creating a product that's high quality and specific to consumers' needs. Want to know more? 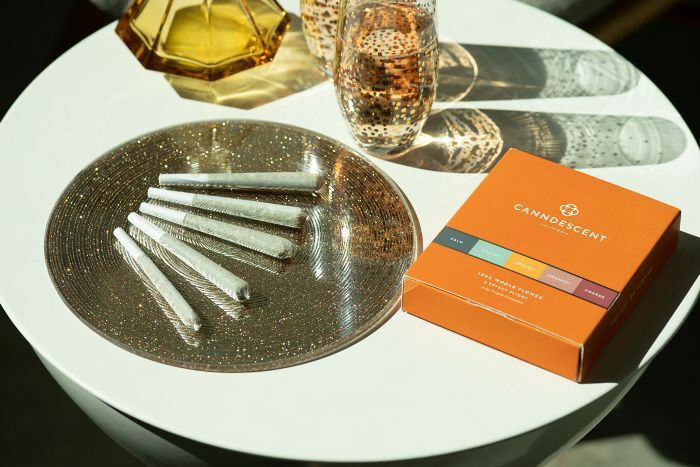 We chatted with Canndescent's extremely knowledgeable CMO, Jenna Habayeb, to get all of the details. What's the biggest misconception people have about cannabis? One of the biggest stigmas around cannabis is the stoner culture—that cannabis is only for 19-year-old boys to use in their moms’ basements. There are so many people in need of this type of outlet. I think the reason it’s becoming more socially acceptable is that we live in this very intense world between texts, emails, and every sort of social media. It’s hard to find real balance, and I think the one thing cannabis does is turn down all of the noise. There are so many healing powers to it. What are some of the known benefits of cannabis? Relief from stress and anxiety, better sleep and focus, and feeling more “in the moment.” Also cannabis can have medicinal and anti-inflammatory properties. There’s still so much research happening around this. So what exactly is cannabis? Cannabis is a plant. There are actually three types of plants: sativa, ruderalis, and indica. I think once people really think about the fact that this is a plant, not much different than say a tomato plant it becomes a little less scary. What’s the difference between the plants? You’ll see things out in the marketplace called indica or sativa, and [those terms] are differentiating the type of effect the cannabis is going to have on you. Sativas are energy-focused—you’re awake; you’re out there wanting to do things. Indicas are more of a sedative, so you want to go to sleep and be calm. So you have indica, sativa, and hybrids as the effect-based indicators. But then you have every strain imaginable too, from Pineapple Express to Blue Dream to Cat Piss; it gets crazy. There are actually three ways to grow cannabis: outdoor, in a greenhouse, and indoor. The reason indoor flower like Canndescent comes at such a premium is because we are creating a controlled growing environment where we meticulously care for the plant, which helps us create consistency and quality in our product. By cultivating Canndescent indoors and measuring eight different environmental variables, we’re able to control how this plant is grown and therefore able to offer a more consistent experience. How do you know what product is right for you? From a consumer perspective, the idea is centered around how you want to feel. We want to make it super simple, so we have five unique effects. ■ Calm: to relax and have a better night's sleep or to relieve aches and pains. ■ Cruise: to cruise through the day, do errands, or clean your house. ■ Create: to be creative. ■ Charge: to be energetic. ■ Connect: to engage with loved ones and focus better on conversations. This one is all about intimacy. Our bodies naturally have an endocannabinoid system that are like little receptors and interact with cannabis. The cannabis plant has cannabinoids like THC, CBD, and terpenes that are like keys that unlock those receptors. Each plant has varying levels of these cannabinoids which interact with your body differently. Do you have any suggestions for first-timers? My recommendation for first-timers is to first decide how you want to feel and what type of experience you want. For example, if you want to be social, use a pre-roll, and if you want to be discrete, use a vape pen. If you have something edible, know that it takes a longer time for you to feel an effect as opposed to smoking cannabis, where you’ll feel it instantly and can pace yourself. Flower: The bud at the top of a female cannabis plant, similar to the fruit. Pre-rolls: Pre-rolled joints that can contain flower. Hemp wick: Candle-like wick that you can use to light a bowl, pipe, or pre-roll so that you don’t burn yourself, or inhale sulphur from a match or butane from a lighter. Vape: Oils that are created from flower extraction and put into a vaporizer type device. Crutches: The crutch is placed at the base of a pre-roll and acts as a filter so you don’t get the actual flower in your mouth. We know what holiday gift we'll be buying all of our friends this year. Want to try Canndescent yourself? Take a peek at their store locator to find the nearest California dispensary near you.